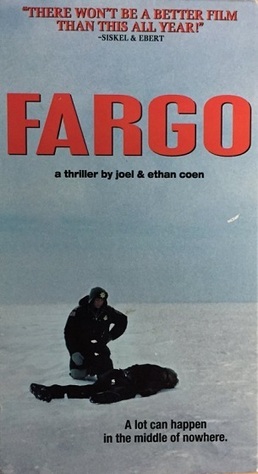 Director: Joel Coen; List Price: $14.95; Format: VHS; Rating: R; Release Date: September 1996; Other: Closed Captioned; Length: 98 minutes; UPC: 780063869331. Condition: Very Good. Blockbuster PVT with typical sticker on tape and some sticker residue on front and back of cover. Otherwise cover is still in overall great shape, and tape plays well. Same cover design as that shown here. Poor Jerry Lundegaard. He's deep in debt. His wealthy father-in-law has no respect for him. He cheats customers at the car dealership where he works. And now he's hired a bumbling duo to kidnap his wife--a plan that goes horribly awry, leading to homicide. Enter Marge Gunderson, one of the most fabulous movie cops in film history. The very-pregnant Marge--played marvelously by Frances McDormand in an Oscar-winning and career-defining performance--just goes about her everyday business, eating (in nearly every scene), talking to the people in the community, and examining bloody corpses as if no day is different from the next. A multiple murder in the small town of Brainerd, Minnesota--home of Paul Bunyan, as the sign claims--seems to have little effect on her. Yet she has an innate cop sense--she is very, very good at her job and determined to solve the case in her offhanded manner.